This week’s Free Stuff Fridays is sponsored by Crossway, who also sponsored the blog this week. 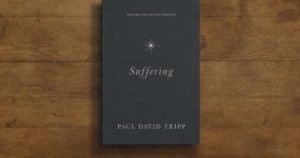 They are giving away a brand new book that I think will be of a lot of interest to you: Suffering: Gospel Hope When Life Doesn’t Make Sense by Paul David Tripp. There will be five winners this week and each will receive a copy of the book. Sometimes life doesn’t make sense. When death, illness, unemployment, or a difficult relationship challenges everything we thought we knew, we can feel utterly unprepared to cope. In his new book Suffering: Gospel Hope When Life Doesn’t Make Sense, best-selling author Paul David Tripp weaves together his personal story, years of counseling experience, and biblical insights to help us in the midst of suffering, identifying 6 traps to avoid—including doubt, discouragement, and denial—and 6 comforts to embrace—including God’s presence, God’s people, and God’s grace. Exploring a wide range of common experiences, this raw yet hope-filled book will empower readers to cling to God’s promises when trials come and then move forward with the hope of the gospel.